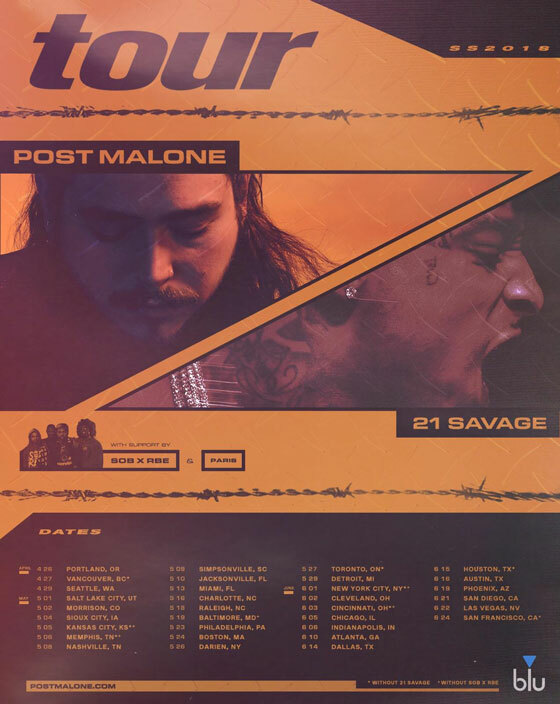 After scoring a hit with "Rockstar" last year, Post Malone and 21 Savage are set to keep their collaborative streak going with a new North American tour. The 28-city run kicks off in Portland on April 26, wrapping in San Francisco on June 24. Bay Area duo SOB X RBE will provide support. Two Canadian dates are included on the trek, bringing the bill to Vancouver's Rogers Arena on April 27 and Toronto's RBC Echo Beach on May 27. However, 21 Savage will not appear at either stop north of the border. Tickets are set to go on sale to the public on Friday (February 23) at 10 a.m. local time. A press release notes that Post's long-awaited project, Beerbongs & Bentleys, will see release soon. He will also release his new Ty Dolla $ign-equiped single "Psycho" on Friday.